The slush pile. It’s talked about and you may have read about it. Editors rather burn it, writers fear it. 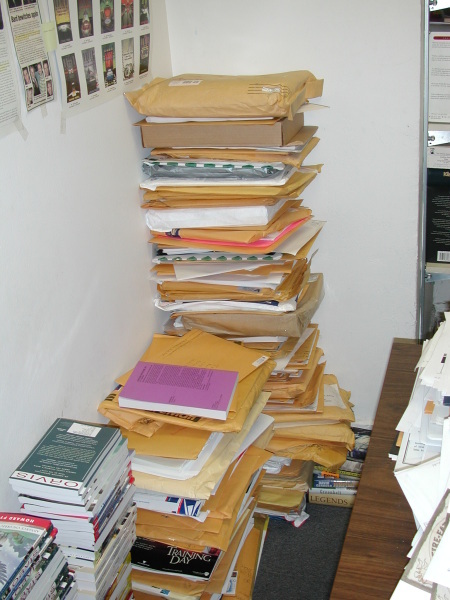 So I thought it would be fun to show some pictures of slush piles from different publishing houses. An Annual Manuscript Bonfire? Click here. Glad I don’t have to read through all those, though. And it is a mercy that most people who provided the tinder will never learn what happened to it. I used to file actor’s resumes for a professional theater; this reminded me of that. I’m glad I don’t have to file them all! That explains the form rejections!!! Yikes. Now that is scary! Yeah, it really puts things into perspective, doesn’t it? The bonfire one was a bit disturbing. I guess you can also look at it when you do get a personal rejection, you know they effort that the editor took to make it. I love those pictures. It reminds me to register for an SCBWI conference! And I missed your Christmas list, which I also love. Nobody ever gets me any of those things *sniff*. Although my DH always gets me a stick drive for backups.